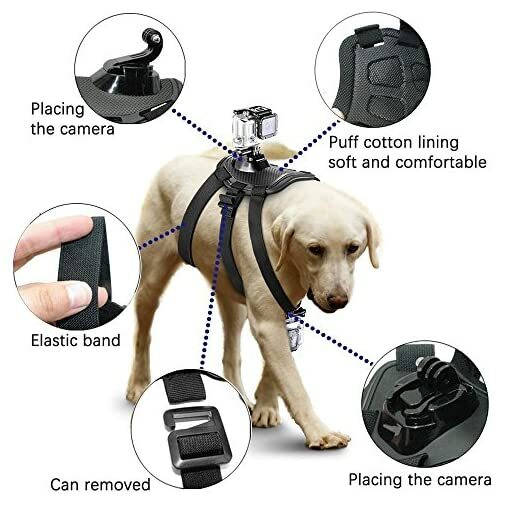 micros2u Gopro Accessories - Pet Dog Harness Chest Fetch Strap Belt Mount with Dual mounting positions + J Hook Mount Adapter For GoPro Hero 5 4 3+ 3 2 | The Best Spy Tech Store Online! [VERSITILE DESIGN ✔ ] Two camera mounts (1 x Quick release & 1 x J Hook Mount): Mounting locations on the back and chest enable a variety of POVs. [TRU-FIT HARNESS ✔ ] Take videos from your dog’s point of view. The Tru-Fit Harness with mount plate allows you to mount an active camera to your dog’s back or chest. Whether you’re hiking, biking, hunting or just running around the dog park, the video camera can catch all the action. [EASY CLEAN ✔ ] Washable + water friendly: Holds up to swimming, splashing, mud and more. Can be machine or hand washed to keep it clean. Take videos from your dog’s point of view. The Tru-Fit Harness with mount plate allows you to mount an active camera to your dog’s back or chest. Whether you are hiking, biking, hunting or just running around the dog park, the video camera can catch all the action. Our five-point adjustment system creates a perfect fit and great stability for the camera. Harness provides plates for mounting. Mounts and camera sold separately. Brand new dual dog or pet mount for GoPro Hero 4/3+/3/2/1. Quality with professional order handling and service. 30 days warranty on all items. [FAST FIT ✔ ] Easy to attach/remove cameras: quick release bases make attaching and removing the cameras quick and easy.